Editor’s Note: Nigel Taylor — who arrived at Eagle Rock in the Fall of 2014 as part of ER64 (the 64th entering group of new students since we opened our doors in the fall of 1993) — has done substantial work with our Professional Development Center. Nigel, who hails from Atlanta, Ga, and Detroit, Mich., hit the deck running by participating in last summer’s Deeper Learning and Equity course and helping to organize and run our relatively new weeklong Summer Institute for educators. Since then, Nigel has presented at the Coalition of Essential Schools’ Fall Forum and worked with professional development associate Sarah Bertucci on a school visit to City Neighbors High School in Baltimore, Md. This summer, Nigel — who is projected to graduate from Eagle Rock School in August — is co-teaching Deeper Learning and Equity with Sarah Bertucci and Brett Youngerman, our 2016/2017 Public Allies Teaching Fellow in Literacy & Literature. And he’s slated to again help run our Summer Institute. 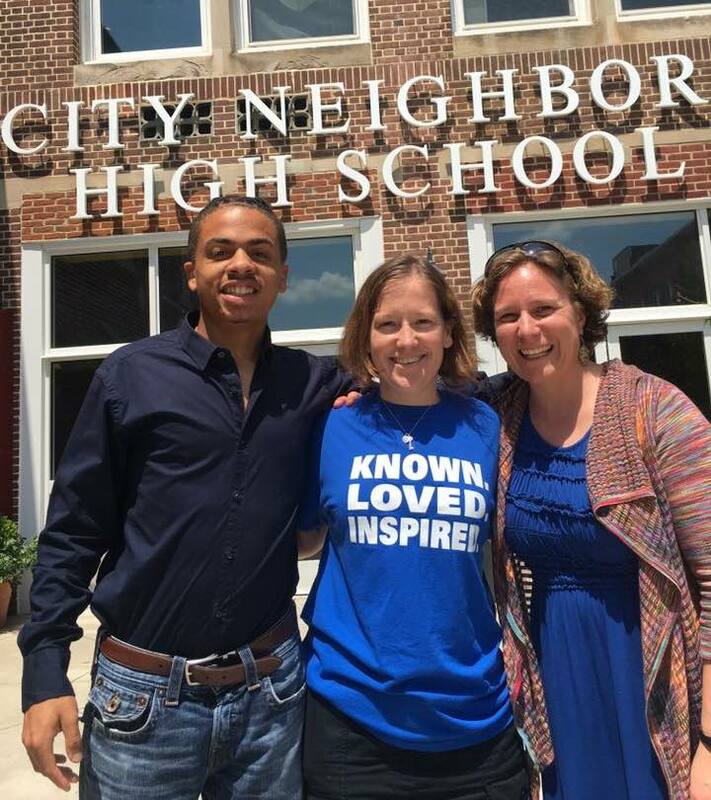 From L-R: Nigel Taylor; Cheyanne Zahrt, Principal – City Neighbors High School (Baltimore, MD); Sarah Bertucci. Eagle Rock: Tell us about your initial experiences with the Professional Development Center. Nigel: I think it was during ER65 (my second trimester) that I first became interested in professional development work. I saw Eagle Rockers conducting tours and talking with visitors, and I started wondering what it was. I began conducting tours and Q&A panels with visitors. It was just the most amazing thing that could happen for me because I was able to practice skills that I needed for the real world. As an Eagle Rock School student, you might not appreciate the value of the tours and the Q & A panels, but when you look back on them, they prepare you for job interviews and running groups. I really got involved with the Professional Development Center’s work after the Deeper Learning and Equity course. It was a little bumpy for me, but I got on track, and man, it was one of the greatest classes I ever had. Now I have some skills to run a group and to run a workshop. The most amazing part about it is seeing the work the Professional Development Center does. If I didn’t talk to the Professional Development Center team, I wouldn’t know what they did — or what they’re changing in the education system out there. That’s what really impresses me — the change that they facilitate around this whole country. Not just in Baltimore, not just in Seattle, it’s everywhere. Even in Detroit where I grew up. It’s an honor for me because I get to participate in facilitating change, I get to talk about my story, and also help the children that are in need. Man, that’s the amazing part about it for me. Eagle Rock: What was it like for you to help run the Summer Institute? Nigel: It was amazing to work with educators — not just putting my story out there, but putting my ideas and beliefs out there about what education should be. It was amazing to see that educators accepted my idea — especially my instructors Sarah Bertucci and Maya Edery (Eagle Rock’s former Public Allies Fellow in Societies & Cultures). They believed in my ideas. The Summer Institute was so great that it felt like a vacation without actually being a vacation. One thing that stood out was the conversations that I had with Cheyanne Zahrt, the principal of City Neighbors High School in Baltimore. I remember we sat down at lunch, and we talked for almost an hour straight. The lunchroom was empty by the time we were done. Hopefully I’ll keep having a relationship with her after Eagle Rock. Eagle Rock: You presented a workshop about the Summer Institute during the Coalition of Essential Schools’ Fall Forum last December. Can you tell us what that was like for you? Nigel: What stood out to me was running the group, and the amazing experience of people coming to me and asking for my guidance on their work. Not just that, but seeing how much student voice matters at the CES Fall Forum — our voices matter in that place. I created change here, and then I went somewhere else and created more change. And I had fun working with Sarah and my fellow Eagle Rock student, Soren Arvidson. The most amazing thing was being able to use my voice and my story in a powerful way that sparked something in educators’ minds to create change in their schools. They didn’t have to take away everything said in our workshop, but if they just took one thing they learned, that one thing can create dramatic change. Eagle Rock: You also worked with Sarah on a school visit to City Neighbors in Baltimore where you were making observations, doing interviews, and helping the school principal and teachers plan their next steps. The emphasis was high–quality independent projects and educators demonstrating that they can advance equity. What stood out to you from that work? Nigel: Talking to those kids instead of talking to educators, I had the opportunity to communicate directly with the students, discovering what’s going on in their lives and what they want to do. I felt proud when Cheyanne and the other teachers took our feedback into consideration. I put forward the idea of having seniors mentoring younger students, which turned out to be what they decided to do. I loved being able to have conversations with the students. As a bonus, Baltimore was just fun. Eagle Rock: This summer you’re going to co-teach the Deeper Learning and Equity course, and you’ll once again help facilitate the Summer Institute for educators. How are you feeling about co-teaching the course? Nigel: I can’t wait. I want to observe this newer generation of Eagle Rock School students — what they’re interested in, what sparks their thought process, and then bring that story out of them. I feel like this course is going to be amazing for me. I’m going to make it amazing. I can’t wait to work with Brett and with Sarah on this. Eagle Rock: What closing thoughts do you have about your work with the Professional Development Center? Nigel: It‘s amazing work. I felt like I was somebody doing something important. This is what life is about — making change. It’s a skill I never thought I could have. By having mentors listen to me and believe in me — especially Sarah — I’ve been presented with these wonderful opportunities. This work gives me confidence, something I never thought I could build. And there’s more to come. This is not where I’m going to stop. Every Eagle Rock student should become involved with the Professional Development Center team, in one way or another. It will build skills you never thought you’d acquire. Skills like improving your public speaking, conducting interviews and becoming professional in your manner and conduct. It prepares you for college where you might want to become involved in ambassador activities. The Professional Development Center experience is something I’ll never forget. It’s the best. This entry was posted in Professional Development Center and tagged Brett Youngerman, CES Fall Forum, Cheyanne Zahrt, City Neighbors High School, Deeper Learning and Equity, Maya Edery, Nigel Taylor, Sarah Bertucci.